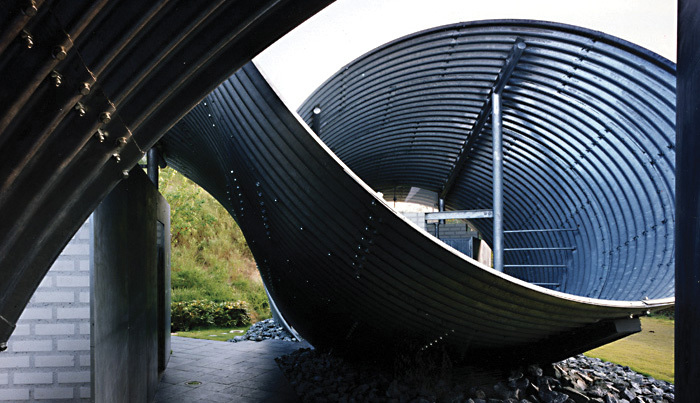 There are many benefits for using galvanizing to protect steel; its durability, toughness, the metallurgical bond that develops between the steel and zinc, but maybe one of the most endearing is the alchemy of its aesthetics. The natural reaction that occurs between clean iron and zinc is reflected within the finish achieved on the surface of the coating. This will change depending on the thickness of steel presented to the molten zinc, its chemistry, and variations within its surface. This is why galvanizing can sometimes be compared to developing a camera film; the natural surface chemistry of which will influence what develops above. In the past, galvanizing has been described as an “industrial” finish, true in that it was the sector that first used the process. Today it has many diverse uses. Its aesthetics can vary from shimmering silver, a crystalline patination through to dark blue-grey, and reflect the natural unfinished character of the coating.